DAB radios are fantastic because they have so much more to offer than a standard FM or AM radio. The channels are more diverse, the sound quality improved, and there are loads more stations than you would normally get. There are many parts of the world that don’t actually support DAB yet, and the UK is quite lucky to have such a good series of transmitters for it across the country. However, there are times when the signal is lacking, and you just need an extra boost. 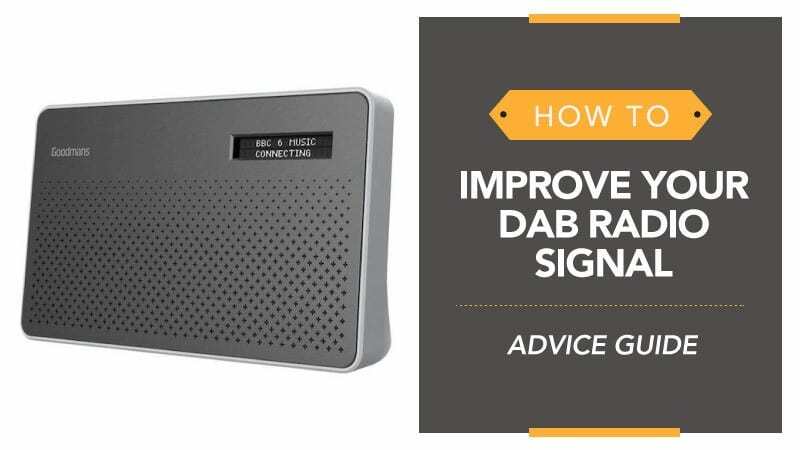 What causes this poor reception, and how can you boost the signal of your DAB radio? In this article, we take you through it all. There are a number of different factors that can cause a poor signal on your DAB radio, one of which is your location. While DAB is widespread in the UK, there are areas that receive poorer connection than others, such as the Scottish Highlands (and islands), Mid-Wales, and the Pennines. You can check online to find out where your nearest transmitter is, which should give you a good idea of how much reception to expect. The location of your radio in your house is also a potential cause of bad signal. If you have thick walls, this can weaken the signal, and so placing your radio near a window or a door is often the best way to get the signal back – or even just to a room that has thinner walls. If you don’t want to move it to a different room, you can also see if adjusting the aerial helps. Similarly, if you are using a DAB radio in your car, the signal can be lost when you are driving through poor areas or under trees, because the aerial cannot reach a transmitter clearly (or at all). Just as with a regular budget DAB radio, your location in the country (or world) can impact the amount of signal that you receive. Interference can also cause poor signal, and it can be caused by a number of different things – one of which is work being carried out on local transmitters, therefore weakening the signal. Other electrical devices in your home (or on your person) could also be intercepting the signal and causing it to become fuzzy and weak. Of course, you may just live in an area with generally poor reception area, in which case there isn’t much you can do aside from aerial adjustments. The most common solution for improving your DAB radio signal is using a different aerial. There are a good number of models that will allow you to use an external area in order to achieve a better level of connection. There is a whole range of aerials out there for you to try, and some even use TV aerials to really boost the signal. The same applies if you are using a DAB radio in your car, as sometimes the connection is poor due to the aerial on your car not being good enough to reach the signal. While most car DAB radios that you purchase come with an aerial for you to install, you also have the option to pick one up that is more powerful so that you don’t lose the signal on your travels. For handheld portable DAB radios, there is one thing that you should always remember – the aerial is usually inside the headphones. As a result, you should always make sure that the wires stay straight and that they don’t get tangled at any point. This way, you keep the signal clear, but you also ensure the longevity of the aerial by helping to prevent damage over time. Finding good signal is not always easy, especially in very rural or forested parts of the country, but there is nearly always a way to improve it and get things working the way they should. With our little guide, you are sure to find the perfect solution to your signal problem – as well as discover the reason it is faltering in the first place. Let us know what you thought of our tips and advice in the comments section below; we love hearing from you.